Other common names: Nootka cypress, sitka cypress, pacific yellow cedar. Found only on the Pacific coast of North America, Yellow Cedar is the hardest known cedar in the world. Prized by boat builders, it has exceptional resistance to weather and insects as well as easy workability. First used by the West Coast Indians for their historic Totem Poles and great war canoes, it is a rare and often difficult to find lumber species. Its durability and ease of tooling makes it readily adaptable for the construction and finishing of homes, schools, factories, churches, recreational centers and a variety of commercial and industrial uses. It grows in a band from Southern Alaska to Southern Oregon. It is one of the slowest growing trees in North America and includes trees that are 700-1200 years old. 50-60 annual rings per inch are not uncommon. This rare and exceptionally beautiful wood species seeks out high and adventurous sites and often grows to the tree line. It is a medium sized tree, with a thin bark. It is slow growing with high disease and decay resistance, as well as oils that make it very aromatic. It grows from Alaska south to Oregon with the largest areas of growth in British Columbia and SE Alaska. Yellow cedar can be used for floors, doors, decks, ceiling paneling, custom woodworking, and millwork. It is very popular for carving as well as versatile when used in industrial applications. It has been traditionally used for boat building because of its long term durability. Racing boat enthusiasts have often used it for high performance shells, and for bridge decking. It stands up to constant wear and load impacts without forming ridges or splitting. It does not splinter, so it is also used on stadium seating. Photo: above left: natural and weathered coloration of AYC shingles. From boat and airplane building to any application you can think of, AYC boards. Moderate in strength yet beautiful to the eyes, it's well suited for coastal environments. Note: all pictures are meant as a generalized example rather than exact match. D and Better Clear - Clear grains but allowances for medium pitch streaks, limited pin holes, hit and miss skips, two knots approximately 1" or their equivalent. Note the different colors above (some boards have been finished). Yellow cedar, like any other wood, has a range of colors from soft yellow to light brown. All beams are available in Clear, Select or Standard and Better grades. Available in lengths up to 24'. Lengths up to 40' available but must be special ordered All Sizes are available. The characteristics that make Alaskan Yellow Cedar a fine exterior siding, decking, and paneling, also make shake and shingle products the most desirable for roofing and sidewall application. It is important to know when ordering Shakes or Shingles the differences between the two. Shakes are split and have at least one higly textured natural grain surface. Whereas shingles are sawn and ahve a relatively smooth surface. The exterior finish of a building is the face it presents to the world. It defines the mood and character of the structure and reflects the image desired by its designers, builders or owners. Alaskan Yellow Cedar siding is available in a range of designs and grades, offering the variety and versatility to complement any architectural style. It adapts equally well to bold and expressive modernism or the well defined criteria of period styling. Above all, Alaskan Yellow Cedar has an enduring beauty that projects an aura of prestige. It is a wood with great dimensional stability and natural decay resistance. Common patterns for siding include tongue and groove, channel, pattern 105 or board and batten. Custom patterns can be created with our specialty milling options. Incorporating a deck into your home is a great way to add value the home, increase your living space and to better your overall quality of life. Alaskan Yellow Cedar is great for decking as it is easy to work with, has a pleasant aroma and is durable yet not hard and unyielding. YellowCedar decking can come in a variety of sizes, but the most popular are 5/4x4, 5/4x6, 2x4 & 2x6. Bear Creek Lumber can offer this cedar decking in random lengths of 6' and longer and can also sell in specified lengths, which will often create premium pricing if specified in long lengths. When we talk about Alaskan Yellow Cedar paneling we are not talking about 4'x8' sheets, but rather tongue and groove, shiplap or similar materials that can be used to panel your walls and ceilings. Yellow Cedar is a great choice for indoor use as it has a nice color range of wood tones, has a pleasant but not overpowering aroma and works in both humid and dry environments. We can offer the Alaskan Yellow Cedar paneling in clear and knotty grades, allowing for our clients to adjust what they order based on their individual budget. The most common widths for paneling are going to be nominal 4" and 6", but we can product narrower or wider patterns through out specialty milling options. Common tongue and groove patterns will include V2E, V4E, edge and center bead, or center match. Custom patterns can be created with our specialty milling options. The field of construction using solid sawn Alaskan Yellow Cedar timbers is greatly diversified. It covers many types of engineered structures; commercial, industrial, and residential buildings; and landscape structures such as bridges, arbors, pergolas, gazebos, field houses and the like. In general, applications can be classified into two very broad use-groups: first, for those structures such as large buildings in which both the strength and appearance of exposed wood members are of equal importance; and second, in landscape, park and garden structures where appearance is paramount. For both use-groups, Alaskan Cedar offers the advantages of natural beauty, design flexibility, exceptional dimensional stability and long term durability. Cedar has a long history of withstanding the rigors of time and weather. It is also recognized structural material with known mechanical and physical properties. These attributes allow the design of timber structures of all types using basic engineering principles and stress-or appearance-rated grades of Cedar. Real wood trim on residential, commercial or industrial buildings perfectly complements any architectural style and is compatible with all contemporary cladding materials. The ideal wood for trim is Alaskan Yellow Cedar. Its dimensional stability, longevity, ability to accept a wide range of finishes, resistance to decay and natural good looks make it the only sensible choice for base boards, corner boards, fascia, skirting and window and door trim. Alaskan Yellow Cedar trim boards are available in Clear and Knotty grades. Trim boards are often available in Surfaced Four Sides (S4S) Surfaced One Side Two Edges (S1S2E) or Rough Sawn textures. Although Alaskan Yellow Cedar is naturally durable, a surface coat is recommended to protect the wood and extend its service life. When selecting a finish coat, make sure it contains the following: water repellent, Fungicide/Mildwcide, Protection against ultra violet light. Penetrating oil-based products, particularly those containing pigments, are recommended for Cedar. Pigments provide increased UV protection. Hot-dipped galvanized, aluminum and stainless steel nails are all corrosion-resistant and all can be used to nail Alaskan Yellow Cedar. Other types of nails, such as electro-plated, are not recommended. They can rust and disintegrate and react adversely with the natural preservative oils present in Cedar, resulting in stains and streaks. Copper nails also react with Cedar and should not be used. Stainless steel is the best choice but hot-dipped galvanized is the most widely used and economical. Sauna Boards, Trim, Fascia, Roofing, Exposed Ceiling. « Alaskan Yellow Cedar Interior Paneling : Sought after for use in saunas, interior pool rooms and rooms that need a bright paneling solution. « Alaskan Yellow Cedar Decking Highly resistant to weather and rot, this wood will make your deck last longer with the added benefit of beautiful colors. 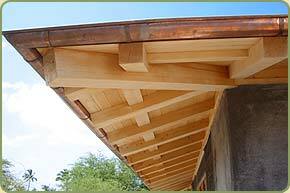 Above: Beams and soffits in AYC. This client in Hawaii made extensive use of rot resistant woods. General properties: Moderately heavy wood, soft, fine textured, straight grained, easily worked and durable. It is rated as moderate in strength, stiffness, hardness and shock resistance. Texture: Light yellow in color, straight grained, even, compact texture with its natural oils giving it a smooth wax like finish. Strength: A strong wood with density equivalent to 29 lbs. per cubic foot at 12% moisture. Durability: Resists weather, rot, termites and corrosion from acid solutions. Has 2 1/2 times the life expectancy of Douglas Fir in vats and flumes. Fire Resistance: Takes almost twice as long to reach flame break-through as other softwoods. Nail holding: Has excellent nail-holding ability. Splintering: It does not splinter, making it ideal for stadium seats, playground equipment and deck railing. Wearability: Dense and tough, it is highly resistant to wear. Excellent for bridges, decks, boats and paneling. Workability: Easy to work with and holds glue well.